If you like a gal who speaks her mind, comes with a heap of mystery and is tough as nails, you’ll be in good company with Saint Joan. 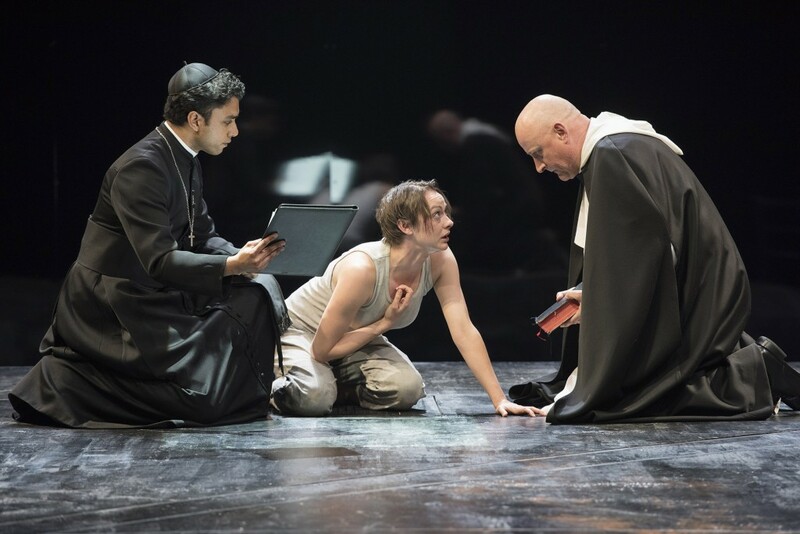 Andrew Lawrie as Brother Martin (left) and Jim Mezon as The Inquisitor (right) try to help Sarah Topham as Joan (centre) see the error of her ways in the Shaw Festival’s audacious staging. Some say centuries before the advent of radio, television and digital content that there was nothing to do in the 15th century except to hear voices in your head. Joan of Arc would beg to differ, or course. Not to be compared to other teenagers of her generation, she was on a mission from God and one that would regrettably cost her in the end. Was she an angel? Was she a fraud? Or just a poor country girl who felt more comfortable in boys clothing with a deeply held conviction that the Brits were more likable on the other side of the English channell and not on French soil. ‘There is something about that girl,’ surmizes Jeff Meadows as a somewhat perplexed Canon d’Estivet. Playwright Bernard Shaw’s Saint Joan—battle worthy in dialogue design and always posing bigger questions that few storytellers have the intellectual capacity to ask—is not the most accessible play of the canon but every bit rewarding in its afterthought. And if a miracle is an event that creates faith, you might just be in for the closest event to a religious experience you’ll ever encounter in director Tim Carrol’s configured interpretation that not only garbs his players in denim, military fatigues and tuxedos but one that harnesses an arsenal of humour along the narrative path. While ensemble members work their way around the sanctimonious layers of injustice that Shaw so smartly plots, Sarah Topham proves to be a revelation as the fearless Joan. Proud, disobedient and way too big for the modern day church and state, she’s an actor that radiates a natural blend of self-assurance before the character pays the ultimate price for failing to learn that you keep your friends close and your enemies closer. Standing trial for figurative heresy is more of a risk in our common era than it was 600 years ago when one reflects on recent events. The Shaw Festival’s divinely dramatic submission reminds us that secular leaders need not be feared more so than the social media backlashes triggered by beliefs stemming from similar voices in our heads.